Growing demand from the IT, commercial and industrial sectors are driving the growth of Singapore Uninterruptible Power Supply Market. Further, the country's government is taking efforts to strengthen the economy by focusing on digital transformation of 23 major industries, which in turn would spur the growth of the commercial and industrial sectors. This would result in an increase in demand for UPS systems in the country during the forecast period. According to 6Wresearch, Singapore UPS Market size is projected to grow at a CAGR of 5.5% during 2018-24. The commercial and industrial segments are likely to acquire majority of the Singapore UPS Market Share in future on account of significant emphasis being put on the manufacturing and hospitality sectors, especially medical tourism and business tourism. Additionally, to boost the country's economic output, Singapore government is pushing the implementation of the digital transformation of the country, with the recently introduced ITM road maps. These framework involves a number of development strategies and goals for the transformation of as many as 23 industries, which include healthcare, hospitality, education, ICT and manufacturing. The strengthening of these sectors would imply an increase in the demand for UPS systems in such domains in the country. Further, government initiatives such as Smart Nation and Digital Gov would also serve as a driving force behind the growing demand for UPS systems in the country. The Singapore UPS Market Report offers an in-depth analysis by kVA ratings, applications and regions. 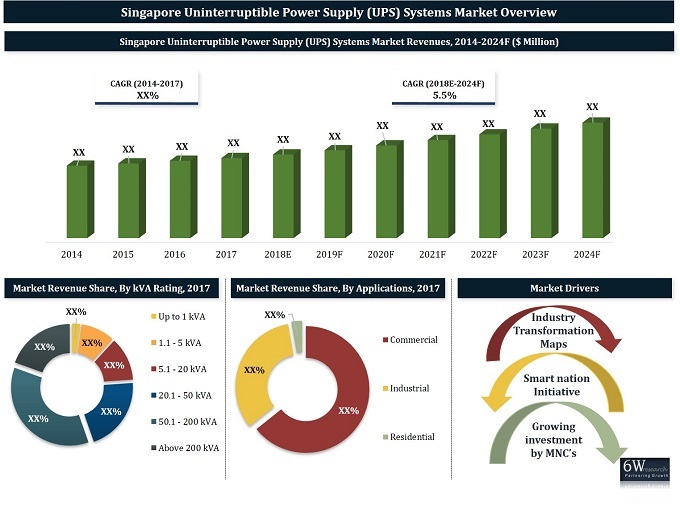 The Singapore UPS Market Outlook report provides an unbiased and detailed analysis of the on-going Singapore UPS Market Trends, opportunities/high growth areas and market drivers which would help the stakeholders to device and align their market strategies according to the current and future market dynamics. •	Singapore UPS Market Size during 2014-2017 and Singapore UPS Market Forecast until 2024. •	Singapore UPS Market Overview on Competitive Benchmarking and Company Profiles.